One of the key events that led to the demise of Mars Hill Church in 2014 was the revelation that the church leaders had used around $250,000 of church money to strategically buy a spot on the New York Times bestseller list for Mark and Grace Driscoll’s 2011 book Real Marriage. Manipulating bestseller lists became a debated topic for several months after it was learned that other leading Christian authors had also used Result Source to manipulate the bestseller list (e.g., Les & Leslie Parrott, and David Jeremiah). Articles in World, Christianity Today, and this blog examined the ethics of the matter. Stepping into the debate at the time was a former Chief Financial Officer (2007-2009) of David Jeremiah’s Turning Point ministry, George Hale. In a January 14, 2015 post, Hale asserted that David Jeremiah used similar book buying practices as those made famous by Mars Hill Church and Mark Driscoll. Hale said he left Turning Point because he didn’t agree with the ethics of using ministry funds to manipulate the bestseller lists and enrich Jeremiah. Turning Point is a large ministry that took in over $47 million in 2013 compared to nearly $40-million the year before. The last two years David Jeremiah’s non-profit has spent more than it made by around $3.2-million. However, the organization’s balance is strong with net assets of just over $9.5-million, as of June 2014. At the time, Hale did not explain just how beneficial the arrangement was for Jeremiah. Now, Hale has disclosed that Jeremiah was able to purchase a $2-million ocean front condominium (San Diego Co., grant deed) in January 2010 not long after receiving a $3-million advance from Faith Words, a book publisher based in Nashville. Hale said, “I never saw a contract between David Jeremiah and a publisher, but I did see an advance check made out to David for $3-million for a multi-book deal.” The books covered by the advance were The Coming Economic Armageddon (2010), I Never Thought I’d See The Day (2011), and God Loves You (2012). All three of these books made the New York Times bestseller list. I began my employment at Turning Point during July 2007. During August of 2007 Turning Point began promoting David Jeremiah’s Book “Captured by Grace” for pre-publication purchase for a donation of $25 or more. I believe that approximately 100,000 books were pre-purchased (I could be wrong on this number but I think it is close) for an average donation of $25 during the months of August and September 2007. When the book was released in October, Turning Point used the money donated for the book to purchase copies of the book from retail booksellers such as Amazon and Borders. Turning Point then sent the book to those who had donated and requested the book. These purchases where timed to get the book listed as a “best-seller.” It worked. After this occurred, I voiced my concern as to the ethics of such action to David Jeremiah. I was also concerned because Turning Point could have purchased the same books directly from the publisher for approximately $10 each instead of the $25 each paid to the book retailers. David assured me that his agent and attorney, Sealy Yates had opined that the transactions were honest and ethical. This same action was repeated during August, September and October 2008 with the same results. I again requested that Turning Point not repeat such transactions as I could not discern any benefit to Turning Point for purchasing the books at retail versus purchasing the books wholesale from the publisher. I thought the transaction to be unethical. David told me that he would take my advice under consideration. During August 2009 David Jeremiah said that he wanted to promote his new book for pre-publication purchase but for a donation of any amount. He had not yet made a decision as to the method that Turning Point would use to purchase the books to be sent to those who would request them. 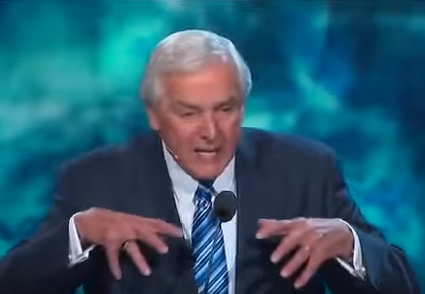 During September 2009 David Jeremiah told me that he had decided to use the money received by Turning Point from those requesting his book to purchase the books at retail from booksellers and not purchase the books from the publisher at a lower amount. He acknowledged that he was aware that this was disappointing to me. Turning Point had received an average donation of $35 per book instead of $25 dollars during this 2009 campaign. Therefore, if my memory is correct, Turning Point had received approximately $3.5 million dollars for the approximately 100,000 books pre-sold. I thought that the added donation over and above the $25 purchase price of the book was meant to benefit Turning Point and was not to be used to purchase additional books at retail. This did not happen. This thought, together with my prior opinion that the entire method was unethical and did not benefit Turning Point, led me to immediately resign my position with Turning Point which I did September 15, 2009. Hale later told me that he was paid until early 2010 to allow a narrative to be floated that Hale retired instead of quitting abruptly over ethics concerns. As a result of the book buying scheme, Turning Point’s membership in the Evangelical Council for Financial Accountability was jeopardized. Hale told me, as did one other source in a position to know, that in early 2010, Turning Point was allowed to drop membership in the ECFA instead of being publicly removed over the bestseller list manipulation scheme. These tactics are not allowed for ECFA members and, according to Hale, Turning Point chose to drop out instead of modify their book business. One consequence of losing ECFA membership was the loss of membership in the National Religious Broadcasters since members are required to either be members of ECFA or some comparable group. However, after years of non-membership, I have learned that Turning Point is a member again. It is unclear if this means Turning Point has renounced the book buying scheme or if the NRB made an exception. Neither organization has responded to my questions regarding Turning Point’s membership. If the return of Turning Point to the NRB means that David Jeremiah has finally taken George Hale’s advice, that would be quite a story. I hope the usual big evangelical cone of silence doesn’t cover up the matter. In any case, with the ongoing silence and secrecy over bestseller list buying, the debate over the ethics of it will continue.